“Well, if she can't be bothered with mincing garlic, I'd hate to see what else she can't be bothered with in life,” whispered the stranger next to me in line. It's sad that many of us will dismiss doing something as easy as mincing garlic because it's too much work. Garlic is the most used herb in the world, has a lot of nutritional value, and I can't imagine cooking without it. This time of year, early spring garlic, also known as green garlic, is at most farmers' markets. Last week when I was at the farmers' market, someone was giving out samples of ramp pesto and I thought green garlic pesto would be just as delicious, with an herb like basil or parsley. I choose parsley because it's a natural breath freshener and it will help counteract the effects of the garlic. 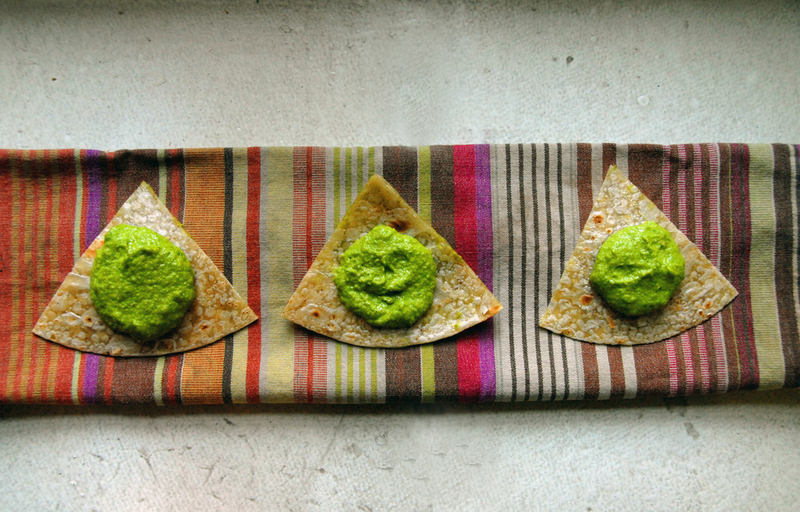 Serve the pesto on some fish or spread on gluten-free brown rice tortilla chips. The garlic doesn't require any mincing, so it's no bother at all! The first time I made this, I used the larger green garlic bulbs and I didn't blanch them. Whoa, was it strong! So I would definitely recommend blanching the garlic. Use younger green garlic that looks more like scallions if you want the pesto a bit milder. Top with radishes or serve with roasted beets for a colorful appetizer or snack. 2 cups parsley, washed and stemmed. (Save the stems to use in a stock). Blanch the garlic for about 30 seconds in boiling water. Remove with a slotted spoon and immerse in ice water to stop the cooking process. Put the garlic, parsley, pignoli nuts and lemon in the food processor and pulse a few times. Add the oil, parmesan cheese or miso, and run until it forms a smooth paste. Add salt and more lemon to taste. If too thick, add some more olive oil. Cut the brown rice tortillas in quarters. Place on a cookie sheet. Bake for about 10 minutes until golden. Flip and bake on the other side. Remove and cool. Serve with green garlic pesto.